Event management is a stressful activity – not having all your ducks in a row is not an option. Once the location is determined, the next major step is to brainstorm and identify all possible tasks and the resources required to complete the tasks, associated costs, and their order. A critical path is the next logical step in planning any event. There are a myriad of tools that can be used to build a work plan from a “to do” list scribbled on a sheet of paper all the way through to an automated timeline process using project management software. To stay on track and on budget, critical path (or timeline) is a must-have for any event planner. The critical path is one of the most frequently used and effective techniques in event planning. 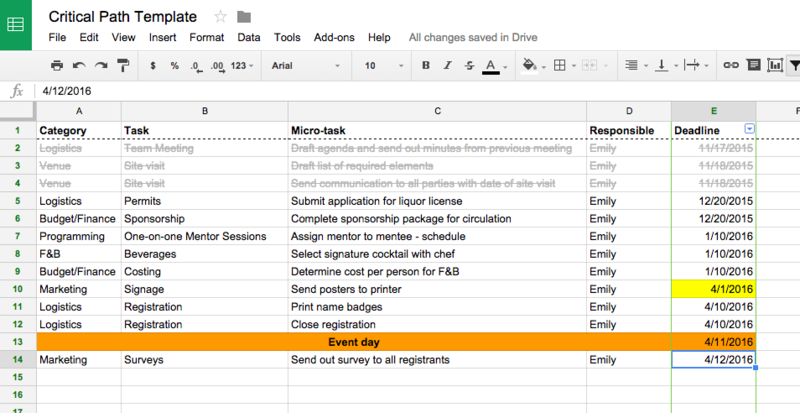 When you’re managing dozens of tasks, dependencies, and people, a critical path can help you keep the event planning process on track and on budget, providing visibility into your event. With so much going on, the critical path provides a clear direction of what must happen next and who needs to do it. Once your timeline is ready and you truly believe that all tasks have been accounted for, this very important document should be shared with your co-workers (anyone in your office who is helping with the planning and execution of this event), the planning committee and your client; it can also be shared with suppliers if you feel that this information would be relevant. One thing to remember: events happen in real time so your timeline should be a living document. Update it when circumstances change and tasks are completed so you are prepared if (and when) something doesn’t go as expected. This is your document and if dates or assigned tasks need to be changed, that is not a problem, but adjust the timeline accordingly to ensure that you are still meeting the important, non-negotiable deadlines. The critical path is more than just a to-do list. It is a continuing team effort where each member is depending on each other for support. To give you an idea of the types of actions to add into your critical path, see the suggestions in the following list. These are for guidance only; each event is different, and your duration for planning will be different, too, but the list is a good starting point.